Episode 32: Today we’re taking a step back from our more formal explorations of a single, dedicated topic, and answering questions from listeners. It’s time for some Q&A! 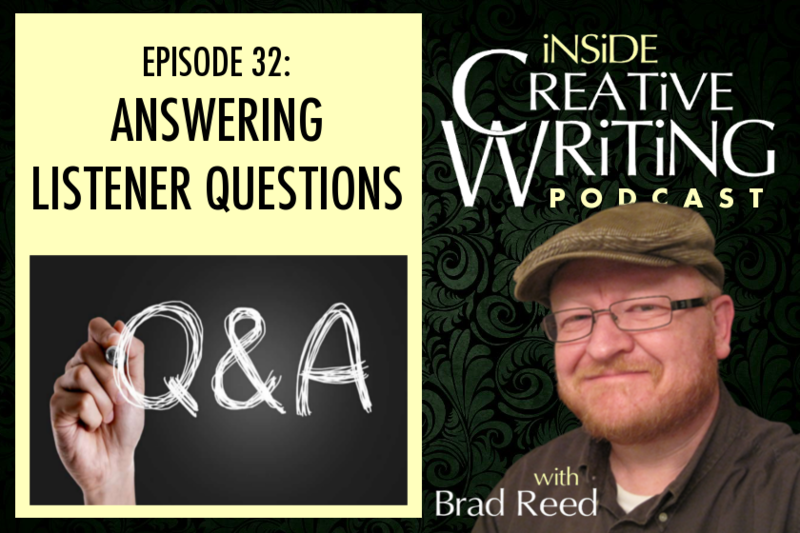 Welcome back to the Inside Creative Writing Podcast! My name is Brad Reed and I’m so glad that you’re spending some time with me today to talk about writing. What a week it’s been! As I record this, I’m just a couple of days away from another school year starting. That means I’ve spent the last week or so fully immersed in curriculum planning and setting up my class room for another great year. WIth that in mind, I thought it was a good week to take a step back from the more formal topics we’ve been doing on the show and do a kind of Q&A drawn from listener questions. We’ll probably run a little shorter today, but maybe that’s okay since we went so long last week! So here we go… questions that listeners of the podcast have sent me over the last few months. How do I describe a person, place, or a thing vividly so the reader can see it in their mind? Remember the perspective of the character who is seeing (or hearing, or tasting) the detail–what would they notice about it? Practice in the “real world”–what is the first thing you notice about a stranger, a place, a thing? How do I come up with the best title for my novel? Look at some of the most successful titles in your genre and see what’s working–you can learn title writing from others just like you can learn writing by reading other people’s books. Make sure it is unique–do a Google Search and see what else will come up when you search for it. Mine your manuscript for a line of dialogue or prose that might work as a title–this is how my favorite book, The Grapes of Wrath, got its name–his wife pulled it from the text. Remember that your title is perhaps your most important marketing element. Make sure it is selling your book. A title like “The President is Missing” tells you exactly what you’re going to get. Someone looking for a political thriller is bound to pick it up. How can your title tell your specific reader that the story inside is exactly what they are looking for? What is the best way to name characters? Everyone has a different take on this. DON’T name them all creatively! This is terrible! And DON’T name them similarly: mix up the letters they start with, the number of syllables they have, even the ethnic flavor if it’s realistic to your story. Make it as easy as possible for your reader to remember their names and associate them with the traits of your character. Sometimes its fun to work against the automatic inference. Have a super bitchy character named Grace, or a musclebound meathead named Winston. Our Wise Word today comes from Stephen Hawking. Our weekly challenge this week: what questions do you need to ask as a writer? Make a plan for how you’re going to get your answers. Previous Post:Episode 31: What is “Confirmation Bias” and How Can We Use It To Our Advantage as Writers?